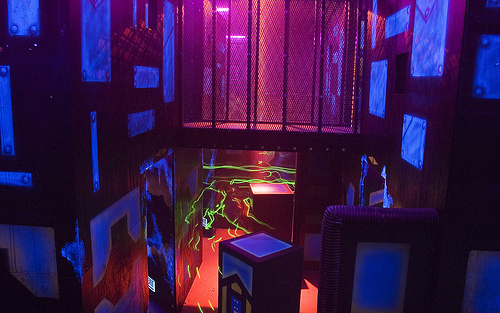 My son's 6th birthday was this past monday, but we celebrated it friday night by taking the kids to play laser tag! On our way over to the laser tag, we saw a rainbow in the distance, I managed to get a shot of it and it brought smiles to our faces! They have never been and we wanted to do something different than what they are used to. A few friends joined us and had at it. The only thing I did not like was that they didnt have any child sized vests and they were a lil heavy for my two kiddos who are pretty thing and short. But they were troopers about it! It was about $9 per person for 20 minutes of play time. We went into a big room and it was all painted in black light and flourescent paint. I loved it! I wish it was in my house! Except I would use it to rollerblade around in! hahaha Could you imagine that?? After wards, Matti got to pick where to eat and he picked Burger King, so we had to oblige. They got lil BK crowns (nice to know they still do that) and we enjoyed our icecream cones too! Bella's version of "the claw"
We went to Toys R Us afterwards, which I was shocked to know that it doesnt close until 11 PM on a friday night! We let Matthias pick out a toy and gave him a limit so he can learn about money and budgeting hahaha. He picked out a power ranger, a nerf gun and some other toy I cant even pronounce but apparantly is really cool. Of course we couldnt leave without the kids riding on one of those mechanical toys that I remember I used to go nuts for when I was young!